Crytek released a new update (2.1) for Hunt: Showdown, its PvE/PvP bounty hunting game released earlier this year on Steam Early Access. This new update adds a spectator mode (highly requested by the community), new weapons and several additional improvements including a new mission condition featuring heavy fog. Seeing the reactions of the community and working closely with their feedback to fine-tune the direction of the game has been an incredible process. It feels like a truly collaborative process, and the game is all the better—and more fun—for it. Below you can find the update trailer and the full patch notes. Hunt: Showdown is available now on Steam for $29.99. 3 new crossbows – Old school crossbow, Hand crossbow and Poison crossbow. Silenced weapons – The Sparks LRR and Winfield now have additional variants with mounted silencers. Throwing knives – A new tool, allows for stealth kills even if you bring the big guns. Specter 1882 Bayonet – A versatile pump-action shotgun variant that works great in close quarters. Combat Axe – Similar to the Wood Axe World Item (except you cannot throw it). A cheap, medium sized weapon that packs a punch. Vitality shot changes – Added new variants: weak and normal variants. Injecting a shot now takes longer. Retrieving projectiles – Crossbow bolts and throwing knives can be retrieved from bodies and walls to be used again. Fog time of day – A new fog setting that shows off the swamps of Louisiana in all its foggy glory. Spectator mode – The ability to continue watching the action through your teammates eyes after being downed/incapacitated or the death of your own Hunter. With this update we are adding a number of additional weapons and equipment to aid Hunters in stealthy game play. This will be great for solo players, who now have more options available to them, if they choose to remain in the shadows. For teams, it is also much easier now to come up with combos that compliment your loadout, adding a silent option for those times when being loud is just not an option. Crossbow – Large weapon that can kill a player with a well aimed hit from a single bolt. Cannot resupply from ammo boxes, but bolts can be retrieved. Hand Crossbow – Medium weapon that is a great companion as a sidearm. Works the same as its larger cousin. Poison Hand Crossbow – Uses poison-tipped bolts that burst on impact. Very powerful against most monsters and can distort the view of other Hunters. Sparks LRR Silencer – Large weapon with an attached Silencer and reduced damage. Stronger sway makes for harder aiming, similar to the effect of the bayonet attachment. Winfield M1873 C Silencer – Same as the Sparks LRR Silencer, but has more ammunition and fires the weaker Compact Bullets at reduced damage. Throwing Knives – Pack of six throwing knives that can be used at short range and retrieved after use (watch where you throw them). Specter 1882 Bayonet – Variant of the first-ever pump-action shotgun that comes with an attached bayonet for improved handling in melee combat. Combat Axe – New early game melee weapon that occupies a Medium Slot. Very cheap, but a powerful option for new Hunters. Weak Vitality Shot – Little brother to the Vitality Shot that heals 50 health, costs much less than the standard Vitality Shot. Bolt Seer Trait – Highlights Bolts and Throwing Knives for better visibility. Bolt Thrower Trait – Reduces the time to reload Crossbows. With this update we are introducing a new setting – Fog time of day. 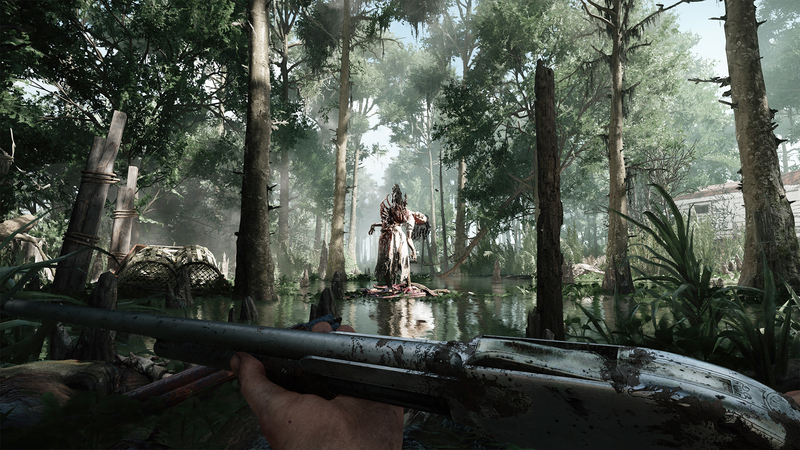 This setting challenges players with reduced visibility while facing the dangers of the swamp.